Riding a six-game winning streak that includes a victory over No. 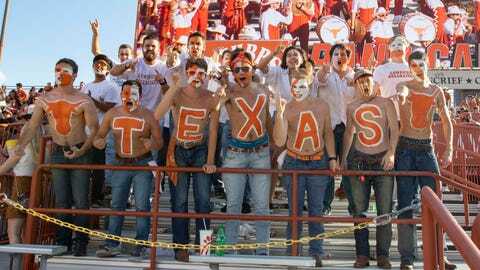 8 Oklahoma, Texas is aiming for a spot in the Big 12 Championship Game and even a berth in the College Football Playoff. For Oklahoma State, coming off a much-needed week off following back-to-back losses, the Big 12 title likely gone, so they are seeking bowl eligibility and restored respectability. The potent Texas passing game, led by dominant receivers Lil’Jordan Humphrey and Collin Johnson, against the inexperienced Oklahoma State secondary, which features two freshmen and two sophomores. The Cowboys rank 97th in the nation in passing defense. While it’s still not certain if Longhorns QB Sam Ehlinger will play due to a shoulder injury, backup Shane Buechele is capable too, stepping in during a 23-17 win over Baylor on Oct. 13. Texas: QB Sam Ehlinger. The Longhorns’ off week undoubtedly helped, but it’s unclear how much Ehlinger will play or how effective he will be. But if he’s healthy, he is a dual-threat weapon that will give Oklahoma State difficulty. Not only has he completed 65.7 percent of his passes for 11 touchdowns and two interceptions, Ehlinger has rushed for a team-high six TDs. Oklahoma State: RB Justice Hill. Following three straight 100-plus yard games, including 189 against Kansas on Sept. 29, Hill gained just 66 and 41 in his last two outings. He needs to have a big day for the Cowboys to have any chance at an upset. Although Texas leads the series 24-8, Oklahoma State has won the last three meetings and is 6-2 in the last eight. . Texas’ No. 6 ranking is the school’s highest since September of the 2010 season. . In this 30th anniversary season of Barry Sanders’ Heisman Trophy, OSU will be wearing throwback uniforms that match the ones from 1988.